"Riding The Waves Of Change"
I was just recovering from the hustle and bustle of our MSA/College ASM which was held in the picturesque town of Kuantan, when I received a gentle reminder regarding the report for the next Berita. Well, it is indeed timely because our Anaesthesia Day for 2012 is just around the corner. This year, our theme is "Surgery In A Day, What Do You Have to Say!" October 16th, 2012 is our National Anaesthesia Day and it is customary to have a weeklong activity of diverse nature to propel and propagate the role of the anaesthesiologist. October 13th (Saturday), 2012 is the beginning of these activities and is marked by the launch of the Anaesthesia Day celebrations by our beloved YB Minister of Health from 0930 to 1300 hrs in the historic football field of Hospital Kuala Lumpur. I urge everyone to spare some time and come and join our colourful activities (telematch, quiz, blood donation, poster presentation and health examination). Concomitantly, with the cooperation of our surgeons, we will be doing a day surgery elective list on that day. The carnival-like atmosphere complete with pompom girls will draw the crowds and we hope that this will make their participation and further understanding of the objectives of this function complete. I implore my friends from the public and private hospitals to also attempt to run a day surgery list on that morning, we need to collaborate and unify to make this possible. So, please try hard, my friends. Our Executive Committee has been active and we have divided our tasks and set our targets for the coming year. CME activities continue to dominate the bulk of our attention and so, members, please do check the MSA website for current information. 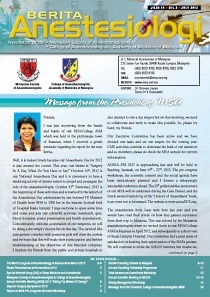 AOSRA–PM 2013 is approaching fast and will be held in Kuching, Sarawak, on June 19th - 22nd, 2013. The pre-congress workshops, the scientific content and the social agenda have been meticulously planned and I foresee a whoppingly successful conference ahead. The 50th golden jubilee anniversary of our MSA will be celebrated during the Gala Dinner, and the much awaited launching of the "History of Anaesthesia" book, is an event not to be missed. The website is www.aosra2013.org. The anaesthetists from Laos were here last year and you would have read their article on how they gained experience from their trip to Malaysia. This was echoed by the Myanmar anaesthesiologists when we invited them to our MSA/College ASM in Kuantan in April 2012, and subsequently to a short visit of Kuala Lumpur Hospital. Our committee feel a great sense of satisfaction on hearing their appreciation of the MSA's gesture. We will continue to invite the ASEAN member, but maybe we, too, may want to see if we could go to their countries and help them in starting new activities like acute pain service, ICU, etc. This is the plan for the coming year! The History of Anaesthesia is being penned down by a select committee of hardworking anaesthetists. Can we all, please help by sending to the MSA any relevant material, pictures, memoirs or messages that may be included in this prestigious book? We will be happy to receive any material that you can share with us. ANZCA pulled out from Malaysia and August 31st, 2012 is the deadline for anyone new to register. The College will provide more news on this matter. Please contact Dr Mary Cardosa for further details or information. I am looking at forging relations with the College of Anaesthetists of Ireland in the near future. Journals or rather the lack of it will no more be an issue. The Committee is purchasing three journals for the reading pleasure of our members. However, I am curious to know how "available" it will be as I foresee the "I cloud" to get dense. Please share your feedback with me. The guidelines entitled "Total Intravenous Anaesthesia booklet" was launched on January 6th, 2012 and is available on our MSA website. and they have asked our Society for some participation from our members. We are indeed overwhelmed that so many of our members stepped forward to share their time and expertise to anaesthetise these elective patients. Thank you once again for your enthusiasm and support and I will give you a report on how the event went. We were pleased that many of our final years students in the Masters programme passed the last examination. Therefore, it is imperative that we recruit them as members of MSA to enable us to tap their strengths and ideas. The Committee and I will look forward to receiving your suggestions to make our Society run better and in a way that is beneficial to our members. To our Muslim members, I take this opportunity to wish Selamat Hari Raya Aidil Fitri. "The truth is that existence wants your life to become a festival... because when you are unhappy, you also throw unhappiness all around." Every four years, approximately 10,000 anaesthesiologists from around the world come together to attend a common congress, the World Congress of Anesthesiology (WCA). The most recent one was held in Buenos Aires (BA) in South America. The honour of hosting the congress follows a rigorous assessment of host capability to do the job and in the last few years, the honour has gone through various cities in the following order in the last decade. Montreal (2000), Paris (2004) and Cape Town (2008) played hosts prior to Buenos Aires and in 2016, the congress will be held nearer home in Hong Kong. It is an honour to attend the world congress for it caters to every need that an anaesthesiologist is likely to have in terms of acquiring knowledge in the field. To be one with 10,000 other like minded anaesthesiologists in the opening ceremony is a humbling experience. One then realises that one has a unique destiny with others to look after the LIVES of patients while in their moments of need and the congress is there every four years to upgrade our knowledge in this common mission of ours. Like most WCA congresses, there are ten parallel sessions at any one time except for the Harold Griffith Lecture which is the plenary lecture, usually held mid week on a Wednesday during the weeklong meeting. In the congress, one is likely to meet the leaders in the field in person. It is a hugely satisfying encounter meeting these authors who have put such great ideas into your everyday journals. Additionally, to be able to exchange knowledge on a world platform is every anesthesiologist's dream and the world congress remains one of these opportunities. All the sessions are held in English but there are facilities for translation and these were mostly into Spanish in BA as South America is mainly a Spanish-speaking continent. It is interesting at times to observe exchanges in Spanish interspersing those in English. The Harold Griffith Lecture this time was straddled by Dr Iain Wilson, Prof Alan Merry and Dr Angela Enright who between them highlighted the efforts put in the LifeBox Project worldwide, a project meant to increase the availability of pulse oximetry, started by the WFSA that is slowly making huge impacts in making surgery safer for patients. 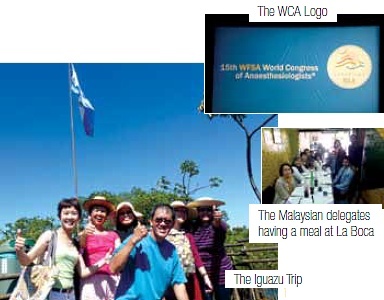 All the anaesthesiology societies of the world come under the umbrella of the World Federation of Societies of Anaesthesiologists (WFSA) which drives this meeting every four years. Many lament at the high registration fees and all speakers to the congress are accorded only free registration and nothing else. Part of the money collected from this congress is used to run the congress but most of it is put aside by the WFSA to run the many activities of its many sub-committees. The conference being very similar to many other regional conferences showcase symposia and exhibitions from the various pharmaceutical companies but done of course in a very big scale. Committees and sub-committees of the WFSA use this opportunity to elect committee members who will hold office for the next four years. These committees include the main Executive Committee plus all the sub-committees in the society which will guide the global activities for anaesthesiologists around the world. A fair number of us had the honor of taking part in this world congress in various capacities. Datin Sivasakthi and Dr Sushila attended as representatives of the Malaysian Society of Anaesthesiologists to the Annual General Assembly. Yours truly was honored to have been given the opportunity to attend both as a member of the Education Committee as well as a speaker in the obstetric section of the conference. Many have also attended with opportunities to showcase their studies either in the form of posters or oral presentation. Those of us who travelled to the congress had to face the hardship of travelling almost 29 hours to reach Buenos Aires and to experience the jet lag that an 11 hour difference in time zone put us into. In order to ward off this jet lag so that we appeared good for the congress itself, many travelled a week earlier to accommodate this problem. Some of us who had planned the trip well were able to take in many of the sightseeing that Argentina had to offer. The more adventurous few even went to neighbouring countries in Brazil, Paraquay and Uruquay as they feel this long trip is unlikely to be repeated in the foreseeable future. The most memorable tourist sites in Argentina were of course the glaciers in El Calafate and the falls in the Iquazu Falls. Five members of the society, were fortunate enough to have planned the trip together with the help of a BA tourist agent and we had whale of a time in the Falls which is entirely different from the Niagara Falls in that, there is a lot of walking to be done which allows the many falls in the area to be appreciated. Argentina is also famous for its tango and many put in the time to have a tango dinner built into their itinerary. As usual many who participated were assisted financially in their travels by the Malaysian Society of Anaesthesiologists who made a lump sum to cover the flight as well as the registration and hotel fees. Participating in the world congress in any capacity is a very enlightening experience and it is more enlightening when you realise you are part of a world community that is attempting to make the burden of CARE lighter for your patients. Gems of knowledge collected in the congress goes a long way to enriching oneself and others especially when they are brought home to be further shared with others who did not have the privilege of going due to time or duty constraints. We can definitely look forward to working towards participating in a bigger way in Hong Kong in 2016. 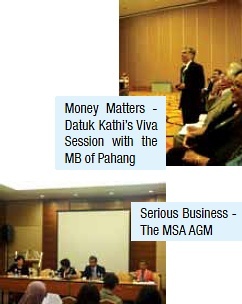 There havebeen suggestions that we may want to consider our towns like Kota Kinabalu as sites for satellite meetings. It will be opportunities to showcase our unique country. Let us take up the challenge of taking an increasing role in the next world congress since it is just four hours away from Kuala Lumpur. It is time to start the research study or to offer to play a role in the committees so that by 2016, we are ready to experience a once in a life time experience with another WCA nearer home! 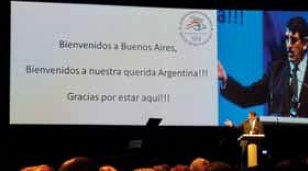 The World Congress of Anaesthesiologists in Buenos Aires was a real eye opener for many of us. The number of participants and amount of information disseminated were impressive. 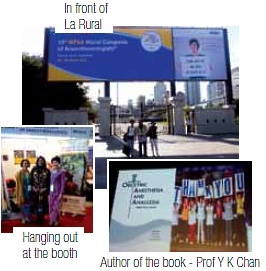 To be able to present our posters at this meeting was indeed a great honour for us. The initial euphoria upon hearing the news of our posters' acceptance was later followed by a feeling of dread and fear of presenting to judges and participants from all over the world. From Hospital Umum Sarawak, two of us presented our individual posters. Posters were presented on LCD monitors in this technologically advanced era. As my colleague Dr Hasmizy put it - A good way to save money, trees and space, notwithstanding of course, the hassle of bringing the posters thousands of kilometers from Kuching. Each was given exactly 12 minutes for the presentation, after which the displayed poster would be replaced by the next. This also meant that you had better set aside some of the allocated time for photo shooting. What a great way to avoid unnecessarily long presentations or discussions. Luckily it went well and I managed to finish my presentation within the stipulated time, as did Hasmizy, allowing ample time for discussion. However, due to the nature of our respective studies, it was also an opportunity for social bonding aside from answering academic questions. Overall, it was definitely a good experience for both of us, despite the pressure sore-inducing journey. Firstly, I would like to thank the College of Anaesthesiologists, AMM, for giving me the permission to form a Special Interest Group (SIG) in Sleep Medicine and Anaesthesia. In October 2010, I was invited by Professor F Chung, Secretary of the Society of Anaesthesia and Sleep Medicine (SASM) to attend the Obstructive Sleep Apnea (OSA) meeting held in San Diego and to be a Founding Member of SASM. About seventy physicians from multidisciplinary groups turned up for the meeting. There was huge enthusiasm to form a Society of Anaesthesia and Sleep Medicine. I was very impressed with it. Hence, it prompted me to establish a SIG in Sleep Medicine and Anaesthesia within our anaesthesia fraternity. The incidence of unrecognised OSA in the surgical patients, ranged from 30-35% which is a significant number. This group of patients is at risk of major cardiovascular events and they also contribute to difficulties in airway management. For many years, sleep medicine was primarily cared for by medical physicians, ENT surgeons, neurologists and psychologists. It is about time anaesthesiologists take an active role in their care. After all, good perioperative management contributes to good outcome. The Special Interest Group of Asia Society in Sleep Medicine and Anaesthesia (ASASM) and the College of Anaesthesiologists, Academy of Medicine of Malaysia, will be hosting a full-day event on "Obstructive Sleep Apnea and Anaesthesia" as one of the pre-conference workshops of the 12th Asian & Oceanic Society of Regional Anaesthesia & Pain Medicine Congress (AOSRA-PM) on 19th June 2013 in Kuching, Sarawak. This first event of ASASM is held in collaboration with the Society of Sleep Medicine and Anaesthesia (SASM). I am delighted to invite you to attend this OSA pre-congress workshop. Learn about the latest developments of OSA and other sleep disorders and how to improve OSA patients' perioperative care during anaesthesia. The conference will feature an outstanding panel of speakers from all over the world. The speakers include Professor Frances Chung (Canada), Professor David Hillman (Australia), Dr Norman Bolden (USA) and Professor Shiroh Isono (Japan) and two local experts on OSA. This will guarantee that the workshop will have a high educational value. Please look it up at our AOSRA 2013 Congress website at http://www.aosra2013.org for more details. Do consider joining the SIG in Sleep Medicine and Anaesthesia, and together we will work towards providing better OSA patient care. My email address: wangcy1836@gmail.com. The Annual Scientific Meeting of the Malaysian Society of Anaesthesiologists and the College of Anaesthesiologists 2012 was held for the first time in Kuantan, Pahang, from 19th to 22nd April 2012 at The Zenith Hotel, Kuantan, Pahang. The Organising Committee sat through numerous preliminary meetings to organise this much anticipated event, from selecting the venue, contacting the speakers, acquiring support from the biomedical industry and sorting out the little issues to ensure that everything went on smoothly. This year, "Riding the Waves of Change" was chosen as the theme which truly reflects the new changes and developments in the field of anaesthesia, critical care and pain medicine globally. This prompted us to bring in numerous eminent international speakers from Australia, Belgium, Canada, France, Hong Kong, Philippines, Singapore, United Kingdom and USA, along with our local prominent speakers and they covered an extensive range of topics such as neuroanaesthesia, regional anaesthesia, day care anaesthesia, paediatrics, obstetrics, cardiothoracic, geriatric and many more. We were indeed honored to have The Right Honourable Chief Minister of Pahang, Dato' Sri DiRaja Haji Adnan Bin Haji Yaakob, to officiate the opening of the ASM. At the opening ceremony, the Malaysian Society of Anaesthesiologists conferred the Honorary Membership on Dr Alexander Isaac Gurubatham for his great contribution to anaesthesia. This year's ASM had an attendance of more than 800 delegates. There were six pre-congress workshops of which three were held at The Zenith Hotel, two (i.e. 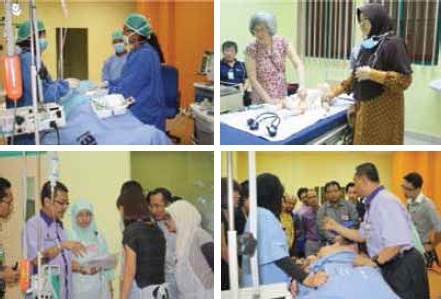 Ultrasound Guided Regional Anaesthesia and TIVA/ TCI with hands–on) were held in the general operating theaters of Tengku Ampuan Afzan Hospital and one on Simulation (Adult/ Paediatric) was held in International Islamic University Malaysia (IIUM), Kuantan. There were a total of five plenaries and 14 symposia during the actual meeting itself. There were also five early morning "Meet-The-Expert" sessions which were met with overwhelming response by the delegates as this was a good opportunity to participate in active discussions with the experts. The AGM for the College of Anaesthesiologists was held on the evening of Friday, 20th April 2012 and the AGM for the Malaysian Society of Anaesthesiologists (MSA) was held the next day (Saturday, 21st April 2012). Apart from the lectures and symposia, we also had an enjoyable evening at the Annual Gala Dinner which was themed 'Flora and Fauna'. The delegates were entertained by dancers from Gandik Emas Group, Kuantan, and many lucky draws gifts were won that evening that attracted delegates to stay until the end of the event to test their luck. Dr Zaini bin Laman and Prof Chan Yoo Kuen were selected as the best dressed male and female according to the theme "Flora and Fauna". The night also saw the winners of the MSA-AZ Young Investigator Award, the MSA Award and the best poster presentation receiving their awards. In summary, the Annual General Meeting / Annual Scientific Meeting 2012 was a memorable event. We thank the delegates for making this meeting a success. We would like to acknowledge the efforts and contributions of the Organising Committee headed by Dr Asmarawati Mohd Yatim, the Scientific Committee headed by Dr Mohd Rohisham Zainal Abidin, the facilitators of the pre-congress workshops, and our secretariat, in particular, Ms Kong, for a job well done. Words cannot describe our sincere gratitude and appreciation to Datin Dr V Sivasakthi and Assoc Prof Datin Dr Norsidah Abdul Manap for their guidance and support. Also not forgetting, the biomedical industrythat came forth with overwhelmingsupport for our yearly continuing medical education, we thank you. Overall, the ASM 2012 was a huge success! The Daycare Surgery Symposium 2012 themed 'Looking Ahead', organised by the Department of Anaesthesia, Hospital Raja Permaisuri Bainun (HRPB), Ipoh, in collaboration with the Department of General Surgery, was successfully held on the 21st of June 2012 at the Ambulatory Care Centre (ACC) Auditorium, HRPB. The symposium was officiated by the Deputy Director-General of Health, Ministry of Health Malaysia, Yg Bhg Datuk Dr Noor Hisham B Abdullah by striking the gong and declaring it open after which there was an excellent multimedia presentation on daycare surgery in HRPB. The course fees of 100 MYR which was generously sponsored by the Ministry of Health, allowed for the enthusiastic participation of more than 320 people from over 40 participating hospitals nationwide within and out of the Ministry of Health. The committee had arranged for a panel of speakers composed of eminent national and international pioneers in the field of daycare surgery in their respective practices, including Prof Girish Premji Joshi from the University of Texas who is also the past president of SAMBA, Prof Chin Kin Fah, Senior Consultant Surgeon, UMMC, Matron Saleha, Head of Daycare Services, HRPB, Ipoh, Mr Yan Yang Wai, Consultant Surgeon, HRPB, Ipoh, Dr Rosalind Simon, Consultant ENT Surgeon, HRPB, Ipoh, Dr P Kannapan, Consultant O&G, HKL, Dr T Ravindran, Senior Lecturer and Hand Surgeon, UMMC, Assoc Prof Datin Dr Norsidah Abdul Manap, Anaesthetist, HUKM, Dato' Dr Jiffre Bin Din, Consultant Surgeon and Head of Department of Surgery, Hospital Kuantan, Dr Haslinda Abdul Hashim, Consultant Anaesthetist, Hospital Selayang and Dr Mary Cardosa, Consultant Pain Specialist, Hospital Selayang. 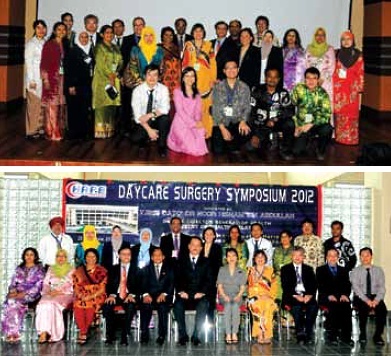 The evening of the 21st of June 2012, saw the completion of the Daycare Symposium 2012 to its successful end with an encouraging response from participants who were motivated and interested in exploring Daycare Surgery as a viable option in their respective practices. Prof Joshi started the seminar with a talk on Daycare Anaesthesia. He spoke on how to 'fast track' patients and the criteria for selection and discharge of patients. Datuk Dr Norhisham, in his keynote speech, addressed the issue of 1 Care and the need to promote daycare surgery as this would help decongest hospitals. 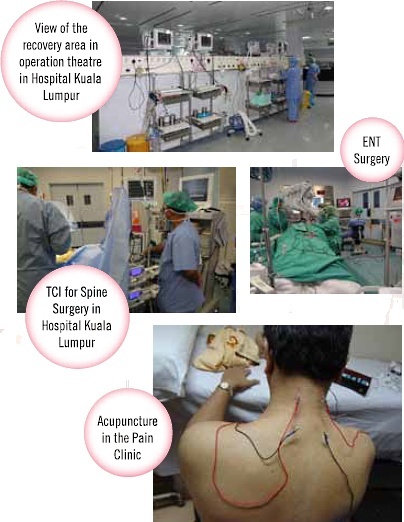 He also highlighted the concept and implementation of pain free hospitals – using minimally invasive surgery, anaesthetic and analgesic techniques, daycare surgery, and the use of traditional complementary medicine in particular accupuncture. After the keynote address, Prof Chin Kin Fah talked about the future of Daycare Surgery, discussing the variety of cases that can be done as a daycare procedure. Matron Saleha delivered a very comprehensive and enlightening talk on how to kick start daycare surgery with minimal resources and took us down memory lane to 1996 when Dato' Mr Kandasami conceived the idea of daycare surgery and implemented it the very following year. The speakers from anaesthesia and the various surgical disciplines updated us on 'What's New' in daycare surgery. After lunch, 'Obstacles To Overcome' was the next topic of discussion with viewsfrom both the surgeons andanaesthetist being taken into account. Their frustrations were clearly illustrated in their talk and echoed by the audience. Dr Mary Cardosa spoke on analgesia for the daycare patient where she stressed that patients must be comfortable and their pain controlled prior to discharge. Outcomes and audits are important aspects that have to be evaluated and studied. This was brought out clearly by Prof Chin and Prof Joshi giving the surgical and anaesthetic views respectively. Participants of the symposium were further exposed to the various adjuncts in daycare surgery and anaesthesia at the 11 booths exhibited by the various pharmaceutical and medical equipment distributors. Two half-day workshops were organised on the 22nd of June which were met with overwhelming responses. The workshops were aimed at demonstrating the use of Total Intravenous Anaesthesia (TIVA) and General Anaesthesia with Desflurane in the practice of Daycare Surgery. Professors Joshi and Lim led each of the two workshops respectively. Both anaesthetic techniques were demonstrated on four different patients undergoing Laparoscopic Cystectomies (TIVA) and Laparoscopic Hernioplasties (Desflurane). The event was concluded with lunch and participants went home by 1pm. The symposium was conceived with the objective of creating awareness amongst anaesthetic practitioners, surgeons, as well as the affiliated supporting staff. It was also aimed at motivating and potentially catapulting the various hospitals into Daycare Surgery as a growing, safe, convenient, efficient and cost effective option that was worth pursuing. Overall, the weeks of tireless preparation, meticulous planning and spirited labor resulted in this Symposium being dubbed as one of the most successful symposiums ever to be organised by HRPB, Ipoh, Perak. The Pre-Congress workshop on simulator for 2012 Annual Scientific Meeting, Malaysian Society of Anaesthesiologists / College of Anaesthesiologists was successfully organised at the Advance Clinical Skill Laboratory, IIUM, Indera Mahkota Campus, Pahang. 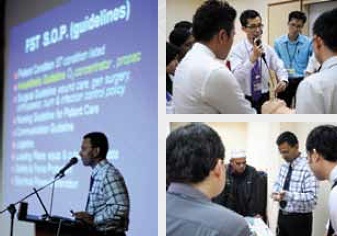 The workshop registration was opened to all doctors and paramedics from all over Malaysia. We received participation from 24 doctors, and one of them was from Melbourne, Australia. The total of nine faculty members is from the Simulation SIG College of Anaesthesiologists, Department of Anaesthesiology & Critical Care, IIUM and Kandang Kerbau Hospital, Singapore. The activities included in the workshop were interactive lectures, handson simulation scenarios, debriefing and feedback sessions. The one-day programme started at 8.00 am and finished at 5 pm. The programme started with interactive lectures on 'Crisis Management In Paediatric Patients' by Dr Agnes Ng S B who is a paediatric anaesthetist from Kandang Kerbau Hospital, Singapore. This was followed by a second presentation on 'Human Performance Issues – Error in Anaesthesia' by Dr Rajeswary Kanapathipilai, a Consultant Paediatric Anaesthetist from Seremban Hospital. After the lecture, there was a short ice-breaking session to enhance interaction among the participants before the practical sessions commenced. All participants were divided into four smaller groups. This was to encourage active participation and to give everyone equal chance of taking the 'hot seat' i.e. playing a role as team leader in crisis management. Four concurrent sessions were conducted simultaneously comprising of three adult scenarios (transfusion error, trauma and post-operative complication) and one paediatric scenario (analgesic overdose). The scenarios also emphasised the importance of communication skills. The overall feedback was extremely positive and encouraging. Most participants admitted that the scenarios were exciting and challenging. Some of them even requested for the scenarios to be repeated. However, due to time constraint it could not be entertained. All participants were pleased with the arrangement of the workshop which include the venue, catering services, materials provided and secretarial services. They hope similar courses could be organised again in the future. The main objectives of this medical simulation workshop were to practice the principles of crisis management (by Gabba), to improve communication skills and to improve patient safety in healthcare practice by providing a safe learning environment. This workshop succeeded in achieving everyone's expectation and providing an enjoyable learning experience in various clinical settings. Anaesthesiologists are acknowledged as the leading medical specialty addressing patient safety. We hope to organise more simulation-based learning to address this issue. First and foremost, we would like to heartily thank the President of the Malaysian Society of Anaesthesiologists for offering us the ASEAN Travelling Fellowship programme. 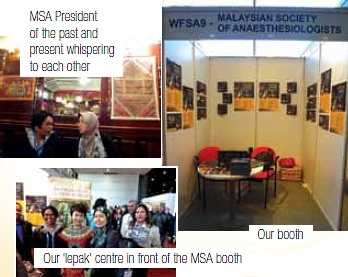 We were so privileged to have been able to attend the Annual Scientific Meeting of The Malaysian Society of Anaesthesiologists held at The Zenith Hotel, Kuantan, Pahang, from the 19th to 22nd April 2012, and to practically see the current practice of anaesthesia in Hospital Kuala Lumpur. We were very excited to have had the opportunity to enjoy both these events throughout our stay in Malaysia. The first part of our trip here took us straight to the Pre-Congress Workshop at the Annual Scientific Meeting. We attended the Haemodynamic Management Workshop with interactive case-based scenarios which comprised the resuscitation of the shocked patient with invasive monitoring such as the cardiac output-stroke volume, stroke volume index and the non-invasive monitoring, which is based on the goal-directed therapy protocol. Traditional monitoring using vital signs alone has been shown to be inadequate in some clinical instances. To avoid inappropriate resuscitation with HR, SBP, CVP and MAP monitoring only, it is suggested that continuous monitoring of dynamic parameters of CO, SV, SW coupled with the goal-directed therapy protocol will enable clinicians to closely manage critically-ill and high risk patients. Oxygen delivery could be more precisely determined this way rather than relying on traditional vital sign monitoring alone. The second part of the ASEAN Travelling Fellowship was to attend the Annual Scientific Meeting. YAB Dato' Sri DiRaja Haji Adnan bin Haji Yaakob, The Right Honourable Chief Minister of Pahang, officiated the Annual Scientific Meeting. It was held from the 19th to 22nd April 2012. The theme of the Annual Scientific Meeting was "Riding the Waves of Change" (to demonstrate how our anaesthetic practice has changed and evolved from the use of ether in 1846 to the current day practice with newer and better drugs, enabling various surgeries to be performed with good patient outcome). We have learned the changing trends in the anaesthetic practice as well as the modification of the traditional practice. The conference encompassed all the areas of anaesthetic practice in obstetric, paediatric, neuroanaesthesia and cardiothoracic anaesthesia. We also learnt new things in the practice concerning ICU and pain management. All these sections are very interesting for every anaesthesiologist. We too were very interested in these lectures and we obtained a lot of knowledge during this meeting. Another interesting part of the meeting was the Annual Gala Dinner. The theme for the dinner was "Flora and Fauna". As per the theme, the silk ballroom was decorated with very large and colourful flowers. The entertainment with all the Malaysian dances and songs were very nice. We also had a chance to dance to the Myanmar Thingyan song usually sung at water festivals in our country. We really enjoyed this part of the meeting. The next place we visited was Hospital Kuala Lumpur from the 23rd to 25th April, 2012. 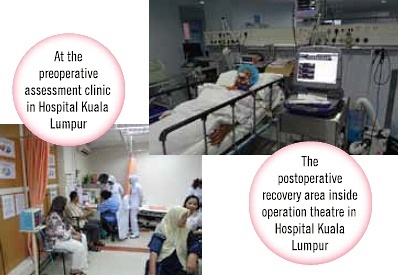 In this hospital, we learned about the duties and activities of the anaesthetic department of Hospital Kuala Lumpur, the operation theatre set up and workload. At Hospital Kuala Lumpur, we were so excited to see the intensive care unit and the pain clinic. We also visited the preoperative assessment clinic and recovery area. In the main operating theatre, we studied the anaesthetic practice for many surgical procedures e.g. spine surgery,gynaecological surgery, dental and ENT surgery, etc. The TCI and desflurane anaesthesia are new updates to us which we still cannot practice in our country. We enquired about the sterilisation of surgical instruments and disinfection techniques for cases with infections in the operation theatre. We also had the chance to study modern anaesthetic equipment such as the TCI pump, desflurane vaporises, intravenous line warmer, computerised anaesthetic drug records, neuromuscular monitoring device and the BIS. I would like to include some of the photos we took while in Malaysia, the experience of which, is unforgettable to us. On completion of our trip to Malaysia, we shared the knowledge and experience of our ASEAN Travelling Fellowship to Malaysia with our junior colleagues in anaesthesiology from Myanmar in Yangon. Our visit to Malaysia is actually our first experience of going abroad and so we were very worried at first, about visiting a new institution and seeing unfamiliar faces, but our worries went away as all of you took care of us during our stay over in Malaysia. Thanks a lot for your kindness. 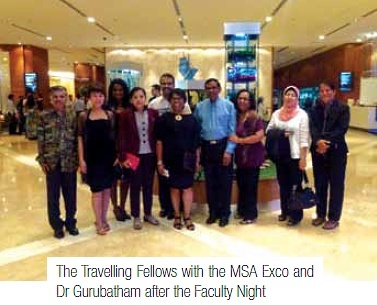 The Travelling Fellowship Programme is a two-week project organised by the Malaysian Society of Anaesthesiologists with the aim of boosting ties and fostering friendship among anaesthesiologists in the region. In this project, we sponsor two anaesthesiologists from developing ASEAN countries to Malaysia to observe our practice, to explore anaesthesia from a different perspective, to share our thoughts and experiences with them, and vice versa. This programme was first started in 2011 with two visiting anaesthesiologists from Laos. This year, we invited two enthusiastic anaesthesiologists from Myanmar in conjunction with the Malaysian Society of Anaesthesiologists and College of Anaesthesiologists Annual Scientific Meeting 2012. The second batch of travelling fellows in this programme were: Dr Cho Cho Lwin, Senior Consultant, Anaesthesiologist from the Ear, Nose & Throat Hospital of Tamwe Township, Yangon and Dr Ni Ni Aye, a Lecturer in Anaesthesiology, attached to the University of Medicine in Mandalay. 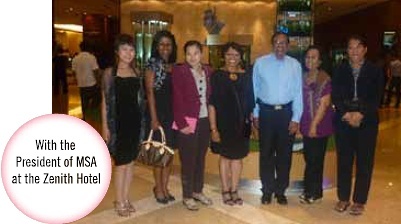 They were here in Malaysia from the 18th to 26th April 2012. They joined us, for the first part of their attachment, in "Riding the Waves of Change", in the ninth largest city and third largest state in Malaysia; Kuantan, Pahang, where the Annual Scientific Meeting was held from the 19th to 22nd April 2012 in the Zenith Hotel. Besides the opportunity to update knowledge in recent advances in anaesthesia, they were also exposed to clinical applications through workshops, and exchange of views and ideas among anaesthesiologists. Cho Cho and Ni Ni joined us for the Faculty Dinner at the Hyatt Regency Hotel, as well as the Annual Gala Dinner. During the annual dinner, we were entertained with a surprise performance by them – a specially prepared, beautiful Myanmar traditional dance. It was all in all a great encounter with our Myanmar counterparts! Their rotation continued with a visit to Hospital Kuala Lumpur, the host for this programme for the second time. Here, they were introduced to the scope of services offered by our department, and participated actively in the operating theatre lists and clinical rounds. They were interested in particular, with the computerised programme used in our Intensive Care Unit and wished to implement a similar programme in their country. They received, as a souvenir, two books from the original author, Prof Chan Yoo Kuen, before returning to their home country. In the future, we hope to build our travelling fellowship into an exchange programme of a similar arrangement. We held a workshop on TIVA in Melaka Hospital on the 21st June 2012. It was organised by the Department of Anaesthesia and Intensive Care, Hospital Melaka, in collaboration with Abbott Laboratories (M) Sdn Bhd and the Malaysian Society of Anaesthesiologists. The main objective of the workshop was to expose and familiarise participants with an alternative mode of anaesthesia. Besides medical officers from the department itself, this workshop was also attended by the anaesthesiology master trainees from other hospitals. The workshop was divided into two main segments; the first segment was a very informative lecture on TIVA by our guest speaker and facilitator, Prof Lim T A from Universiti Putra Malaysia (UPM). Prior to the lecture, this workshop was opened and officiated by anaesthesiologist, Dr Lim T C. The lecture started at 8.00 am covering topics from setting up TIVA, model selection, drugs, induction, maintenance, and monitoring. After the lecture, we had the hands-on session on TIVA, i.e. demonstration on elective cases in the operating theatre. Two rooms were used, a special thanks to our colleagues from the Orthopaedics Department who supplied us with patients for this workshop. Excited participants were divided into two groups and they trooped into the OT enthusiastically. Prof Lim T A showed participants, in a step-by-step manner, the operating of the Target Control Infusion (TCI) pumps. Schneider model was chosen where effect-site concentration was used. Propofol and Remifentanyl infusions were given in both cases. Induction of the patient was quite an excitement as the participants were very eager to get a grasp of this method. Once the patient was intubated and we came to the maintenance phase, it was a great opportunity for the participants to further discuss and have Q&A sessions regarding the topic with Prof Lim himself. A short coffee break was held at around 10.30 am, where participants took turns going for break and alternating between the two rooms running cases on TIVA. Throughout the session, participants were showed how to titrate the infusions using the target concentrations according to the vitals and BIS monitoring of the patients, and what to do if any problems arose. A delicious lunch was provided by the kind representatives from Abbott Laboratories (M) Sdn Bhd. The workshop ended at around 4.30 pm. Participants were very satisfied with the incredible information and great exposure obtained from this workshop. Certificates were given to all participants. As a conclusion the workshop was a fantastic experience to all and on behalf of the Organising Committee, I thank all the participants, specialists, medical officers, medical attendants and the GA nurse team for making this workshop a success. When the President, Assoc Prof Datin Dr Norsidah Abdul Manap asked me to represent her to attend the College Ceremony and the Annual Scientific Meeting of the Australia and New Zealand College of Anaesthetists (ANZCA) / Faculty of Pain Medicine (FPM), I had a lot of mixed feelings. On one hand, I was free during that time but on the other hand, was I the right person to attend? I am now more familiar with international intensive care icons and in fact, I have never attended any international anaesthesia meeting though I attended quite a number of international intensive care meetings. Thanks to Assoc Prof Datin Dr Norsidah who affirmed me and hence, I was on a trip that ended with fond memories and unusual experiences. I flew to Perth via Singapore for obvious reasons. I must say that I arrived at the Changi Airport feeling quite lonely. However, time passed by very fast and before I realised it, I was already at Perth Airport. The wide variety of movies available on Singapore Airlines had kept me busy. The Perth Airport is quite small and I was out of the immigration checkpoint with my luggage within half an hour. Getting to the city centre using public transport was easy and by the time I reached the hotel, I felt at ease and happy. Perth is a civilised city and there was nothing for me to worry. All was said about my feeling about the trip. Here, I would like to share with you my experiences in this trip to Perth. I was really thrilled when I walked on to the stage in the Academy gown together with other presidents from the international colleges of anaesthesiologists and presidents from the local colleges of Australia. The College Ceremony is what we refer as convocation of our local universities. There was no VIP. We, the presidents, the supposed VIP who made up the Stage Party, made the Ceremony auspicious and solemn. A total of 163 new ANZCA Fellows were admitted to the College by examination and via the international medical graduate specialist (IMGS) programme. Each of the fellows went up the stage one by one to shake hand with the President of ANZCA, Prof Kate Leslie, and received her congratulations. As a spectator on stage, I could feel the joy and smile of every fellow and though the ceremony might look "boring", I enjoyed it very much. I found two Malaysians among the 163 Fellows. Syabas to them! The Ceremony ended with an oration 'A Career in Humanity' by Associate Professor Kelvin Kong, the first Aboriginal Fellow of the Royal Australasian College of Surgeons. As I was sitting behind him and the microphone, I could not hear him very well and thus, the oration did not benefit me much. Later in the day, I found out that his passion is to improve the quality and accessibility of health and education services for aboriginal and Torres Strait Islander people and ANZCA announced a donation to the Foundation for Surgery of the Royal Australasian College of Surgeons for work on indigenous health initiatives. What a noble contribution! This was a big meeting with about 1,500 attendees. There were six concurrent sessions together with 39 workshops, four education workshops, five TRIAD workshops, 39 small group discussions and four quality assurance sessions every day. There were also six breakfast sessions and one lunch session. A ticket was required for entry to all the workshops, small group discussions and quality assurance sessions except the education workshops. This meant that the registration fee for the meeting only allowed delegates to attend the concurrent sessions. We are in fact, very considerate when we organise our Pre-Conference Workshops in our Annual Scientific Meeting. I was impressed with the Opening Ceremony; simple, short and sweet. The President of ANZCA, after the usual speech, showed a self-made three-minute video on pulse oximetry which ended with an appeal to the delegates to support the ANZCA project to provide pulse oximeters to low resource countries. That was a good strategy which utterly appealed to me. At the end of the ceremony, when the master of ceremony welcomed all delegates to the exhibition booths, the back stage suddenly opened and there, the whole exhibition area appeared to welcome all delegates. There was a moment of awe and then a great applause broke out. What a great design it was. Yes, the ASM was held at the Riverside Theatre, Perth Convention and Exhibition Center which was just built about three years ago. The highlight of this year meeting was the introduction of ePosters. These poster sessions were moderated by keynote speakers, invited guests and senior fellows with an interest in that session's topic. 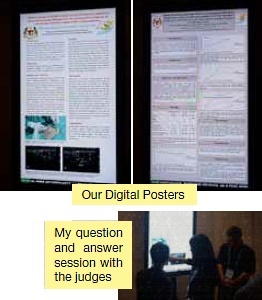 The ePoster format allowed the contributors to present the information in high resolution photos and images, movie clips and sound, and the delegates could browse posters by field, rate posters, leave feedback and access poster information electronically after the meeting. There were six computers with 40-inch monitor for showing the ePosters, of which the contents would be changed every day. Looking at the ePosters, I was once again appalled at the tremendous pace the computer technology advances. I managed to attend one of the education workshops i.e. the workplace based assessment workshop which turned out to be an eye opener for me. I had always felt that my assessment of performance of medical officers or specialists might not be objective enough. I was also curious on how the workshop would be conducted. I believe that all of us were disappointed by the decision of ANZCA not recognising FANZCA training in Malaysia, Singapore and Hong Kong. After attending the workshop, I could understand the reason why ANZCA has recently produced four assessment tools to assess trainees in the workplace, namely Mini clinical evaluation exercise (Mini-CEX), Case-based discussion (CbD), Direct observation of procedural skills (DOPS) and Multi-source feedback (MSF). With each assessment tool, simple instruction sheets and paper forms of assessment are produced. At the end of the assessment, the assessor has to grade the trainee in an independent scale of 1 to 9. For scale 1 to 3, the trainee needs assessor in the theatre suite. For scale 4 to 6, the trainee needs assessor in the hospital. For scale 7 to 9, the trainee does not require direct supervision. All clinicians and supervisors of training are asked to assess the trainee using this format so that the assessment will now be more fair, reliable, flexible and valid. All assessments are to be carried out regularly with the paper forms of assessment filled up by the supervisor of training. Education workshops are designed and held to teach clinicians on this format of assessment. I was truly fortunate to be able to attend this sort of workplace based assessment workshop. The workshop was well run and took three and a half hours. It consisted of lectures and simulation assessments interposed with breakup groups. There were only 15 participants, yet there were four instructors who were keen and experienced. I would like to share with you one of the assessment tools, the Case-based Discussion Assessment, an assessment of a discussion based on the anaesthetic record of a case that the trainee has done fairly independently. During the workshop, a trainee was asked to discuss a case with a supervisor and all participants were required to discuss in the small breakup groups on whether the trainee had discussed the case well and the supervisor had guided the trainee well. At the end of discussion, each breakup group would decide on the marks to be given for each aspect of assessment based on the CbD paper form of assessment. When we finally gathered back again after the breakup groups, apart from discussing on the marks, the trainee also gave her view and feeling on the whole assessment encounter. In this way, all participants of the workshop could completely grasp the essence of assessment of and guidance to trainee which would be convincing to all parties involved. Another aspect of training and assessment of trainee that was repeatedly stressed in the workshop was providing feedback. Feedback needs to be given at the earliest opportunity and at an appropriate place in a safe environment. Feedback needs to be constructive and to be on what has been done well and what would help the trainee attain greater independence. The workshop absolutely inspired me. Fairness and credibility do not come easy but are achievable. Even when we produce forms which may look self-explanatory, we need to teach people how to fill up the forms as correctly as possible. 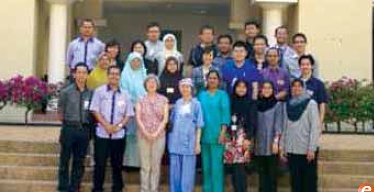 The Department of Anaesthesia and Intensive Care, Hospital Raja Permaisuri Bainun, Ipoh, organised its 2nd Airway Management Workshop on the 9th of March 2012. The invited expert was Consultant Anaesthesiologist Kolonel (Rtd) Dr Jaseemuddin Abu Bakar. The objective of this workshop was to create awareness amongst healthcare providers regarding the basic aspects of airway management. The 9th of March fell on a Friday which is the day our hospital usually holds its weekly hospital CME in the main auditorium. Coincidently, it was also the Department of Anaesthesiology's turn to chair this session and of course, we were most privileged to call upon our invited expert Dr Jaseem to give the talk! Dr Jaseem gave a very interesting and enlightening talk on 'Field Anaesthesia'. He related his experiences of serving in the army and heading the medical unit of the army relief efforts in Afghanistan and Somalia. This kept the packed audience enthralled throughout the talk. For many in the crowd, it was truly an eye-opener. The workshop properly started after the hospital CME. A total of 60 participants were present. This number includes doctors, nurses and paramedics from hospitals all around the state of Perak. The workshop started with a lecture by Dr Jaseem on the basics of airway management with clinical scenarios. Participants were encouraged to envision themselves facing the different scenes and discussing the management options. After this lecture, the participants were divided into seven groups and each group was assigned to a station respectively. The groups rotated stations after a set period of time. The stations covered the basics of Supraglottic Airway Devices, Fibreoptic Intubation, Difficult Intubation Situations, Percutaneous Tracheostomy and Airway Adjuncts. There was a special station manned by Dr Jaseem where he shared his knowledge on how to improvise in dire circumstances. An example was how he fashioned a makeshift 'jet-ventilator' using a drip set, a 3cc syringe, a large bore cannula and an oxygen tank. As Dr Kavita Bhojwani put it, it was 'just like MacGyver'. Throughout the day, participants were actively involved in the 'hands-on' stations and had their queries answered by the experts. By the end of the day, most of the participants were satisfied with the organisation and content of the workshop. Feedback forms were filled, certificates were given out and the workshop ended on a satisfying note. I have a good reason to be pleased and proud. 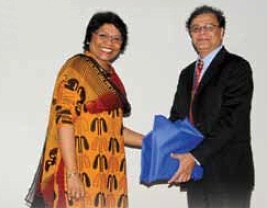 The College of Anaesthesiologists (CoA), AMM, welcomed one Fellow (FAMM) and 17 Ordinary Members (AM) at the recent conferment / induction ceremony on 12th July 2012. This is a big jump from last year's figure (of six AM Members) and I hope this is a sign of more memberships to come! There has also been a flurry of activity lately, particularly in the liaison with sister organisations with regards to postgraduate and sub-specialty training and examinations. The 46th MSCM was successfully held with more than 400 delegates from 12th to 14th July 2012 at the Shangri-La Hotel, Kuala Lumpur, with the theme 'Cardiometabolic Diseases: Are We Up for the Challenge?' 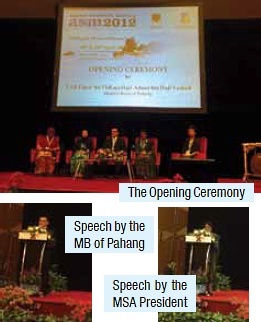 The opening ceremony was graced by His Royal Highness the Raja Muda of Perak, Raja Dr Nazrin Shah Ibni Sultan Azlan Shah. This formal ceremony also witnessed the induction of new Fellows and Ordinary Members, all gowned up to add grandeur to the occasion. This time, the CoA had a big crowd and we did not feel intimidated by the other Colleges at all! The AMM also conferred Honorary Memberships to Presidents and Council Members from various countries. Dr Jeanne Moriarty, the President of the College of Anaesthetists of Ireland (CAI) and Dr Lindy Roberts, the President of the Australian and New Zealand College of Anaesthetists (ANZCA) were here to receive theirs. It was a great event, made even more memorable with the dinner hosted by the CoA, together with our counterparts from Ireland, Australia, Hong Kong, Singapore, and our local ANZCA representatives. We hope this social gathering is the beginning of a bright relationship and future liaison with these anaesthetic bodies. Of the many issues discussed at AGM of the AMM, I have to bring to your attention that the ammendment allowing the Academy to conduct specialist and subspecialist training, and award the certificate of completion thereafter was passed. All Colleges will be expected to follow suit and propose similar ammendments in their by-laws. It was timely that the Presidents of ANZCA and CAI were here to discuss and elaborate the current situation which has taken us all aback. Since my last message, there has been a minor change. In brief, the deadline for trainee registration in this region has been extended to 31st August 2012 for enrolment into the current (old) format curriculum, and ANZCA training will cease to be recognised here in mid-2018. 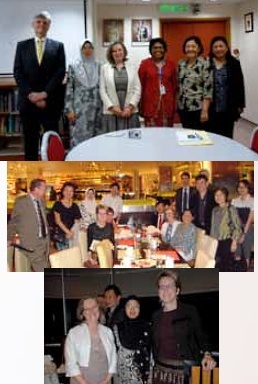 An Asian Transition Working Group has been formed to consult with Hong Kong, Malaysia and Singapore Fellows and trainees about ANZCA training from 2013 (www.anzca.edu.au), so keep abreast with updates at their website. We took the opportunity to meet with the President and Chief Executive Officer (CEO) of CAI to discuss future possible liaison pertaining to postgraduate, specialist and sub-specialist examinations and training. The Primary FCAI is set to be conducted here but we have to await further news on the recognition of our training in Malaysia. We will need to continually strengthen relationships and seek strategic collaboration with other training organisations. On that note, I would also like to report that Dr Tan Cheng Cheng represented the CoA, AMM, when we were invited to the ANZCA Annual Scientific Meeting in Perth, on 12th-16th May 2012. Although the CoA is not directly involved in the Master's Anaesthesia Programme, we have started contributing and assisting in various ways. The CoA is represented in the Anaesthesia Specialty Conjoint Board and we sponsor the yearly production of log books for the trainees. In the recent May 2012 M.Med (Anaes) exams, the CoA nominated Dr Tan It as the local external examiner for the Final examinations and Dr Mah Kin Kheong as observer for the Primary examination. We sincerely thank you for your tireless contribution and we hope more academically inclined members will step forward and render your expertise. There is a need to compile a list of future tutors and examiners if want our CoA to be involved in future training and examinations. The Ministry of Health Pain subspecialty exit examination was held on 5th July 2012 in Putrajaya and the two successful candidates were Dr Awisul Islah and Dr Devanandhini Krisnan. The CoA supported this effort by partially sponsoring the external examiner Professor Dr Pongparadee Chaudakshetrin from Mahidol University, Bangkok. As the President of the CoA, I was also invited to be on the panel of examiners. There were a total of six examiners including two non-pain specialists. Such an open and transparent system is important in view of future accreditation of the subspecialties. It is also hoped that the subspecialty programmes will be extended to non-MOH candidates. The CoA initiated the Recommendations on Sedation by Non-Anaesthesiologists (Adults) more than two years ago and we are happy to report that the final document will be out soon. The College of Surgeons had no objection to the proposed recommendations, but said they were not in a position to endorse them. All other participating bodies had no such dilemma. Please note that the Recommendations on Sedation by Non-Anaesthesiologists for Paediatric patients is being formulated by the College of Paediatrics and the SIG in Paediatric Anaesthesia, CoA. Following issues brought up at the last CoA AGM in Kuantan, we have nominated a review committee for Recommendations for Safety Standards and Monitoring during Anaesthesia and Recovery, led by Dr Lim Wee Leong. The abovesaid recommendations was last edited in 2008. You can direct further suggestions to this team via our secretariat at acadmed@po.jaring.my. 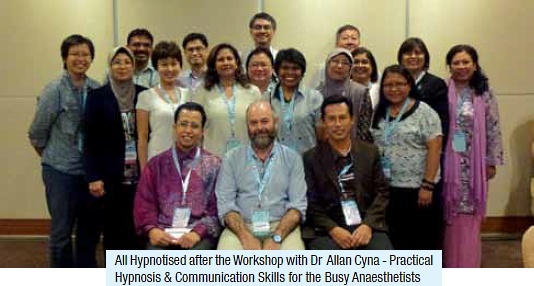 In this issue of Berita Anestesiologi, Prof Dato' Dr Wang Chew Yin introduces the SIG in Sleep Medicine and Anaesthesia. I hope more convenors will follow suit and even contribute updates or articles of interest to the fraternity. I have no doubt that the SIGs will assume more important roles in leading the specialised fields of anaesthesia. We are still at the stage of generating interest as we have yet to have a consolidated group of subspecialised expert in every field. 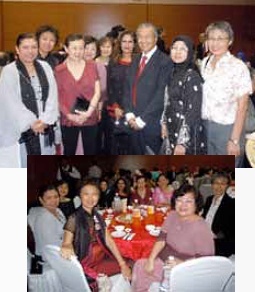 The CoA supported the Academy's launch of the T J Danaraj Book by YAB Tun Dr Mahathir Mohammad on 5th May 2012 at the T J Danaraj Auditorium, Academies Building. The medical act has had its third reading in parliament and will be sent to the Dewan Negara to become law in a few months. It is a slow process, but you should be one step ahead and register yourself as a specialist with the NSR (www.nsr.org.my). After all, it is your right to be registered as a specialist if you are one. The procedure, however, may take time and requires documentation. So, start searching for your documents! The other topic of great interest currently, is the CPD points that will be mandatory for renewal of your annual practicing certificate (APC). The method of recording and monitoring the points as well as the actual point requirements are being looked into. We will all have to be geared into this and not expect a simple signing when applying for our APC! I wish all Muslims a blessed month of Ramadhan and Salam Aidilfitri.